Led by a small Indian start-up founded by a bunch of college kids, Indian companies are taking on the global giants in the tablet computer market. Bangalore has become a scare word for Western companies. Ask Barack Obama or John McCain and they’ll tell you that more than China or a resurgent Russia, what keeps them awake most nights is the fear that the Indian city will take the remaining jobs in America. Until now only software and accounting jobs were being transferred to India. But now comes the hardware hunt led by Bangalore-based tablet computer maker Notion Ink and suddenly the likes of Apple are sitting up and taking notice. That’s because the most exciting tablet on the planet currently is not the Apple’s iPad, Samsung’s Galaxy Tab or Motorola’s Xoom but Notion Ink’s Adam. “Created with love by Notion Ink Design Labs in India,” says the manufacturer’s message on the back of every Adam tablet. That’s what it is all about – a labour of love by college kids from India’s premier Indian Institutes of Technology. A band of young techies led by their blogger CEO, Rohan Shravan, have developed a tablet computer that has ruptured the fabric of the electronics universe. Indeed, while the iPad is merely popular, the Indian tablet has a cult following. The cheapest iPad costs $500 while the most expensive one will set you back by $829. The Adam costs a lot less, starting at $375 while giving you much more, plus more features are coming via updates. Other tablets can’t seem to avoid ending up like the iPad, which is perhaps why Apple has launched a copycat lawsuit against Samsung. However, the Adam has a unique, ergonomic and wedge-shaped design with a rounded rubberised edge. This improves visibility and ensures you won’t drop it accidentally. The Android tablet sports a 10-inch screen, has a 178 degree rotating swivel camera and a PixelQi screen, which makes it the only tablet you can read in direct sunlight. Try reading the iPad outdoors and you’ll see what I mean. The only problem with the Adam is getting one. Every single Adam is sold out. As a loyal fan I’d been waiting for their release date and I assumed I could just buy it off their website. Well, I was wrong. Last year Notion Ink only invited those people who had posted comments on the company’s blog. Now, that left me completely put off. I wrote a stinker on the blog but they never approved the post. Anyway, during the next round of orders, a few agonisingly long weeks later, I bagged one. It took a month to arrive in New Zealand but finally I had my ‘aha’ moment. 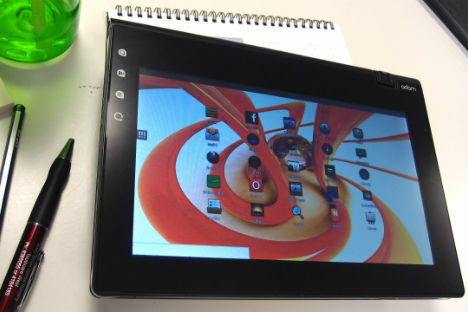 The Adam is a totally cool tablet and it will give anyone hours of joy. Whether it is taking notes, reading ebooks, scrolling photos, or video playback, the experience is outstanding. Stores in Auckland New Zealand: Photo taken with the Adam. The Adam doesn’t have the iPad’s brilliant screen resolution but it more than makes up for it with its versatility. For wireless it has Wi-Fi, 3G and Bluetooth. It also has an ambient light sensor, navigation and maps, proximity sensor, voice recorder, compass, accelerometer, photo editor, QuickOffice, Paint, comics e-reader and music player. It offers an HDMI port, two USB ports, one mini USB port and a mini SD card slot, which increases the 5GB storage by another 32 gigs. The 3.2 MP auto focus camera is not the best in its class but under the right conditions it takes great photos. Oh yes, there have been teething troubles. Some users have experienced software glitches – which are expected from a start-up – but to their credit Notion Ink has sent out regular updates which have fixed most bugs. The Adam also suffered at the hands of amateurish tech writers. They quoted the rants left by dissatisfied users on blogs, but they forgot that even Apple occasionally encounters problems. In fact, a colleague ordered an iPad but returned it because it came with a faulty screen. The replacement was also returned promptly because the same problem happened again. In India, it faced a different – if predictable – roadblock. Shravan revealed on his blog that a container of Adams was held up at Mumbai customs because Notion Ink refused to pay a bribe to some weasel. The corrupt Government official was eyeball to eyeball with the bold new India and the weasel blinked. Despite the viral marketing coup, Notion Ink is still a lightweight in the tablet arena. The Adam is still relatively unknown and Apple has a seemingly unbeatable lead. When the tablet race started two years ago, it was among the first off the blocks but now virtually every major brand has jumped in. Also, a bunch of Indian companies are training their sights on the tablet market. Their most popular offering is Aakaash which retails for an unbelievable $50 ($35 for Indian students). In late December 2011 when Datawind, the company that makes Aakaash, started taking bookings, they got so much traffic to their retail site. Datawind has over 1.4 million pre-orders and is getting 100,000 orders a day. A marae - sacred Maori temple. Other companies like heavyweights Reliance, HCL and Beetel as well as newcomers Olive and LACS are selling their own versions at prices that global companies begin to imagine. Smaller players like Micromax and Lava are waiting in the wings. Shravan isn’t worried about the likes of Apple either. “The market is too big for one product to rule. And we are here for decades to come, so we want to take our time to become a threat to anyone,” he says. Perhaps because Notion Ink doesn’t have deep pockets it has been rather slow to launch Adam 2, despite fervent appeals from fans. But on January 21, 2012 they announced a partnership with Texas Instruments for the next generation Adam 2. The new Adam will use nearly every single hardware feature in a “user customisable” application. People will be able to use the tablet for logic analysing, medical imaging, signal acquisition and processing, 3D modelling and multimedia. To provide better service, the company has opened stores in the US, Germany and India. “Right now we are into the process of scaling up and looking for more talent,” says Shravan, who managed a coup of sorts by poaching people from iTunes. It is heart warming that a small Indian company has attracted so many fans around the world. Indeed, the Adam’s most loyal fans are in the US and Europe who have easy access to the best tablets in the world. What Notion Ink has done is what India is traditionally good at: leveraging high tech talent to produce brilliant products that are impossibly affordable. Satellite and rocket maker ISRO built a $90 million spacecraft that landed on the moon and discovered water; Mahindra makes a $5,000 SUV; and Olive offers a $40 smart phone. Bangalore is not yet the technological epicentre of the known universe, but after the Adam it can legitimately aspire to that title.